These individual cakes are a beautiful presentation, giving each diner a cake of their own with a cream and berry topping. They are also a little healthier than most cakes, with whole grain flour, and a bit of applesauce to replace some of the fat (nobody will miss it!). Preheat the oven to 350°F. Lightly oil 6 8-ounce ramekins and put them on a sheet pan (or alternatively, use an oversized 6-well muffin tin instead of ramekins). In a large bowl, whisk the pastry flour, unbleached flour, cocoa, baking powder, baking soda, salt and light brown sugar, making sure to crush and lumps of sugar with your fingers. In a medium bowl, whisk the egg, applesauce, yogurt and vanilla. In a small pan, warm the oil and chocolate until the chocolate melts, and stir until smooth. Whisk into the yogurt mixture. Stir the wet mixture into the dry mixture just until well combined. Portion level one-half cup measures of batter in each ramekin. Smooth the tops and bake for about 30 minutes, until a toothpick inserted into the center of a cake comes out dry. Let the cakes cool on a rack for 5 minutes before running a paring knife around the edge of each and tapping out onto individual plates or a platter. 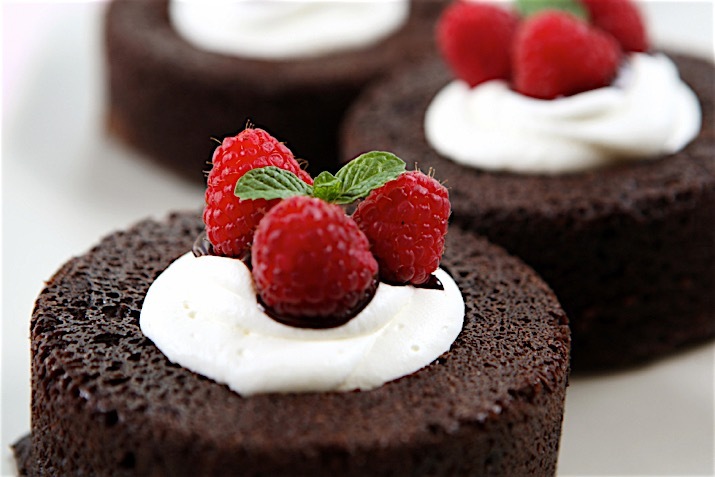 When cooled, serve each cake topped with a tablespoon of whipped cream, three raspberries, and a sprig of mint.